So what goes on after the curtain comes down? Many people are unaware of just how much work actually goes on at the theatre when there is not a performance getting ready to go on- or some people think that the Parkway Playhouse only does things in the summer. This is simply not true. In fact some of the most critical work at the Parkway Playhouse takes place when there ISN’T a show being performed and it takes a year of planning for productions to go from idea to opening. The Parkway Playhouse facility is OLD. It is also charming, unique, full of character, and there truly is nothing else like it. Over the years the theatre has spent thousands of dollars and even more in volunteer man-hours keeping the building in the condition that it is currently in. (We are long overdue for some renovation!) But we have to keep working on it. Last year we fixed the roof, redecorated the bathrooms, sprayed for bugs, built a Memorial Garden, and CLEANED! Our current Board President, Alice Hutchins, is the queen of volunteer workdays and they are fun and the work done makes a huge difference almost immediately. This past year, we had a building inspection and we had some upgrades to make. The most noticeable change is our front door now has upgraded handles and panic hardware. We are also working on our stage floor…. and, yes,.. more CLEANING! 2. The Show Goes On! 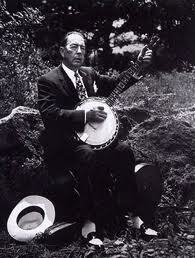 You may not be aware of it but we will open 3 more shows this before the 2011 is out. The Parkway Playhouse Jr. program is working on two musicals that will both be performed by the up and coming performers in our performing arts training program for students between the age of 5-18! The first show is A YEAR WITH FROG AND TOAD and it will run on November 11 and 12 at Mountain Heritage High School and tickets will be available at the door. This musical is based on the children’s book and if you want to know what it means to embrace life, then come and watch some young drama students sing and dance their hearts out retelling this story of an amazing friendship. Bugsy Malone is based on the cult 1970’s film that featured Scott Baio (that’s right… Cha-Chi, Charles, reality TV) and Jody Foster in a world of hoodlums, thugs, and heavys who sort out their differences by “splurging” their rivals with guns shooting whipped cream. It is funny, witty, charming, and about to go on the road. That’s right- BUGSY MALONE will be included in the 2012 National Junior Theatre Festival, which is held in Atlanta, Georgia in January of 2012. You can support the participating Parkway Playhouse Jr. students who are performing in this musical by coming to our December 15 performance at Mountain Heritage HS. Then it is off to Atlanta. The third show we are working on is our Holiday production and the last show of our 2011 Season. BEAUTIFUL STAR: AN APPALACHIAN NATIVITY. 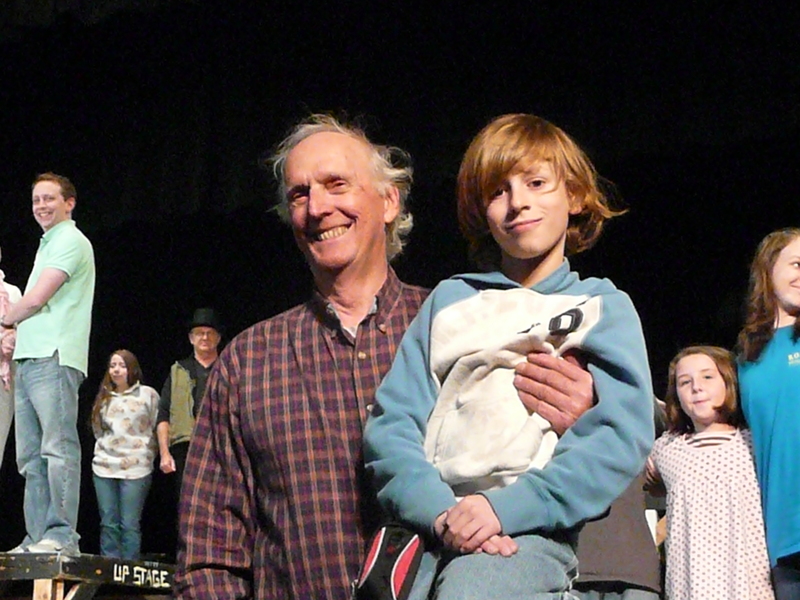 This production combines the nativity story with traditional mountain music and story telling. It was created by North Carolinians Preston Lane and Laurellyn Dossett. It is a play within a play- which is to say that the characters in the play are in fact getting ready to perform a play. It is wonderful. It features a great local cast including Parkway Playhouse staple performers Roberta Whiteside and Rob Storrs and is directed by the equally fabulous team of Ami Pisano and Steve Grindstaff. Since the show takes place in a church we decided to do it in a church. We were lucky enough to have the Bald Creek Methodist Church welcome us and they are hosting this production which will run December 8, 9, and 10. This activity could be called a lot of different things. But fundraising is a big deal for any non-profit organization. The Parkway Playhouse operates on a budget of about $200k each year. Sure we sell tickets, but given that the average ticket price is just a little over $15 we would have to sell twice as many tickets or raise the prices which would make the theatre inaccessible to some. We don’t want that, so it is through the generosity of our growing family of donors that we are able to make theatre affordable to almost anyone in our community. Fortunately supporting the Parkway Playhouse is easy to do and the average annual gift to the Parkway Playhouse is about $100. Some donate more, some donate less. 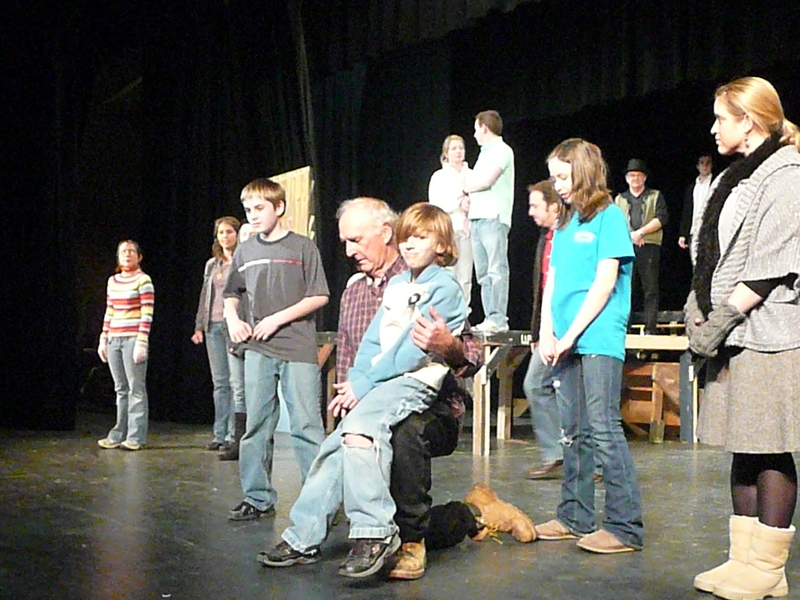 The fact is that if 25% of the people who attended a play in 2011 donated $25 the theatre would be financially secure. We are looking to meet our 2011 fundraising goal of raising $9000 more before the end of the year. (If we exceeded that goal we would be ok with that too….). We are also looking to make fundraising easier for people to take part in. For people who might like to support the theatre but may not feel comfortable making a lump sum donation can now do an installment pledge through our secure website. People can also make their full donation by using our website as well. If you can make a donation and help us reach our goal we hope you will- there is a link at the bottom of this post and that you will consider sharing it with other theatre-lovers. The website needs revamping, grants to be written, press releases to go out, mailings to be posted, tickets to be sold, events to be planned, and productions to be designed, scheduled, cast, and then rehearsed. Our first show of 2012 opens on May 4, 2012. That is 191 days from now…. or 27 weeks or 4600 hours….no matter how you look at it the time will fly and it will be showtime again. Posted on October 26, 2011 October 23, 2013 Author Andrew GallCategories 2012 Season, Classes, Parkway Playhouse Jr., Theatre newsTags A Year with Frog And Toad, Alice Hutchins, Bugsy MaloneLeave a comment on So what goes on after the curtain comes down? 2011 has been a great year for the theatre in so many ways. The theatre was the 2011 Recipient of the 2011 George A. Parides Award by the North Carolina Theatre Conference, our 2011 production of ROBIN HOOD: THE LEGEND OF SHERWOOD got top honors in the locally written production category along with 2010’s THE BALLAD OF TOM DOOLEY; the theatre had its longest season ever with great productions going from May through October and we are getting ready to start rehearsals for our holiday production very soon. ….and we have a great new season to announce. In many ways it is a signature Parkway Playhouse season with big musicals, a classic of the world stage, an entertaining look at a critical person from our region’s history, and the return of a holiday favorite. There are new plays from local writers (6 NC Playwrights will have their work performed at the Parkway Playhouse in 2012)- the Parkway Playhouse has made a unique committment and indeed some of our most exciting productions have come from the imaginative minds of people right in our backyard. 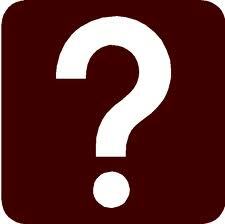 There are also some special events that we cannot announce yet because we are still working on them. Set in the heart of Appalachia, this world premiere play chronicles the work of Horace Kephart: librarian, academic, author, outdoorsman, and founder of the Great Smokey Mountains National Park. Using storytelling, humor, and music, this play captures the essence of one of North Carolina’s most fascinating “adopted” sons. It’s 1970 and Elvis Presley is missing. His manager, Colonel Tom Parker, needs his star for an extremely important live performance. (You see, he owes a certain mobster a bit of money). Oh, and the show is in 24 hours. When the search for the real Elvis proves fruitless, he looks for the next best thing – an Elvis impersonator. But where can he find one that he can pass off as the real Elvis? And what has the real Elvis been up to anyway? This riotously funny story will have you wanting more and keep you guessing until the end! Bounding between festive celebrations and bloody duels to the death, battles of wit and soaring romanticism, Shakespeare’s Romeo and Juliet is the world’s greatest and most enduring love story. From their first shy glances to their last heartbreaking kiss, the star-crossed teenagers choose each other in spite of their feuding families’ ancient grudge, as their love races towards a final confrontation with fate. Set against the backdrop of their perennially dismal football team’s surprisingly successful season, three long-time friends reluctantly acknowledge the importance of their man-love for each other despite widely divergent lives. This family holiday classic combines the classic story of Ebenezer Scrooge and his timely redemption by three ghostly visitors with some of the most beloved holiday music. Watch for tickets to go on sale in the fall of 2012. A great snow… I mean show! So we are in the final few days of rehearsal for A CHRISTMAS CAROL and we get walloped with a 2-day snow storm! The cast has largely been undaunted by this. They have been showing up to rehearsal with huge energy and we have literally and figuratively been plowing through. We have had a great time singing songs and putting together a show that captures the spirit of the Christmas Season with Dickens’ timeless tale of ghostly redemption. It really is a lot of fun. This is the first time we have done a major production on this scale outside of our normal season. While the cast features a number of seasoned professionals, the real treat is the energetic performances of the younger cast members – many of whom are making their first foray into theatre. The youngest member of the cast is 4 the oldest is in their 70’s. Despite the range of ages, everyone in the cast is clearly relishing in the production. One of my favorite moments in the show is when the cast joins Tiny Tim and the Cratchits in singing ‘What Child is This’. At the heart of this production is Bruce Chuvala- who plays Ebenezer Scrooge. Bruce is a fixture at the Parkway Playhouse and his Scrooge is wonderful and the transformation from a Christmas-averse miser to #1 Holiday-enthusiast is unforgettable. I have seen actors throw themselves into a role-but Bruce has gone all out. The guy in the red shirt is me. The little girl is actually my daughter, Hunter, who is making her Parkway Playhouse début in the children's ensemble of A CHRISTMAS CAROL. We are with Gabriel Garland and Bellami Mencis. We are all nervous about the show – not just the normal we are about to open jitters but that we will have no audience because of the fear of more bad weather. So get the word out, and come and see the snow…. Posted on December 14, 2010 Author Andrew GallCategories 2011 SeasonTags A Christmas Carol, Bruce ChuvalaLeave a comment on A great snow… I mean show! 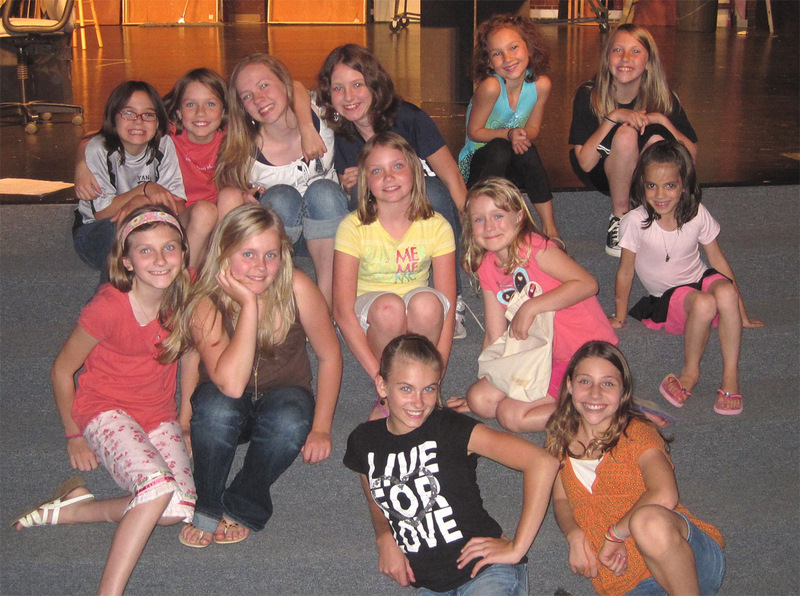 In the fall of 2010, the Parkway Playhouse, Jr. opened the doors to children ages 6 to 18 for their first session of theatre classes. A wonderful time was had by all! A total of 34 students spent 8 weeks exploring various elements of theatre arts. Our elementary students ventured into the excitement of imaginative play, while learning performance skills as they memorized and practiced poetry with clear diction and lots of charisma. The teen students dove straight into monologues, while continuing to practice improvisational skills and discovering basic fundamentals of life in the theatre. Our instructor, Mary Katherine Smith, is a Parkway Playhouse Company member who just so happens to also be a passionate educator. Mary Katherine was last seen in Guys and Dolls as Miss Adelaide and Lily St. Regis in Annie, which she also choreographed. She has training from international instructors from all over the world and has worked in various educational studios and institutions with ages 2 to 70 over the past 10 years. We are happy to add her to our Parkway staff as Director of Education and Outreach and are eager to see what she brings to our organization. 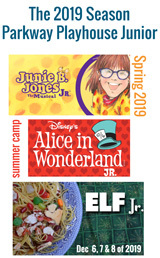 We are now moving full steam ahead as we plan for the Spring of 2011 Parkway Playhouse, Jr. classes! We have extended the Spring session to 16 weeks and have added a new age to the equation but opening an 8 week session for 4 and 5 year-olds. We are very pleased to introduce Andrea Bailey as a new teacher for the Spring. Andrea brings with her a deep passion for music, and especially the benefit music has on children and young adults. Andrea is the music director of Bright Hope Laurel United Methodist Church and is a member of the Southern Appalachian Chamber Singers and a graduate of the Mars Hill Music Department. She is working on A Christmas Carol for the Playhouse where she is serving as music director, and was last seen on stage this summer in the productions of Pride and Prejudice, Guys and Dolls, and Annie. We are very excited for this new addition to our educational department. We are also thrilled to announce that on the evenings of April 29th and 30th, the Parkway Playhouse, Jr. will be producing their first annual Country Western Show! This will give elementary and teen students an opportunity to hone in on performance skills, while uncovering movement, vocal/choral, and character techniques. Stay tuned for upcoming information about Parkway Playhouse, Jr. summer camps and programs!!!! ﻿The Parkway Playhouse turns 65 in 2011 and 2010 was the most successful season in the theatre’s history! It is hard not to feel like there are HUGE expectations of the Parkway Playhouse after an explosive 2010 season. I like to tell people that next year will feel a lot like this past year- except different shows. Hopefully, you – that is the magic ingredient after all. The number of people involved on stage, backstage, fixing the building, volunteering to usher, playing in the orchestra pit, sewing costumes, painting sets, etc. Theatre, at its finest, is an expression and reflection of the community it serves and that to me is what was most exciting about 2010 and what I am most looking forward to with 2011! Our community is dynamic, energized, and eager for a new adventure. Think songs from musicals that HAVEN’T been seen at the Parkway Playhouse or selections from musicals that SHOULD be done at the Parkway Playhouse. More on this fundraiser/special production soon…. We are opening earlier this year. This year the Parkway Playhouse will open on Mother’s Day weekend with the amazing story of how Annie Sullivan met the blind and deaf Helen Keller and taught her communicate with the outside world. A great inspiring and inspiring story! 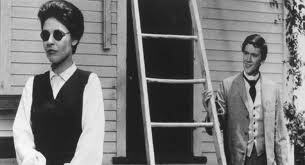 Look at the guy on the right (that is Anne Bancroft on the left in the motion picture The Miracle Worker)…. The guy on the right is Parkway Playhouse’s own Andrew Prine in his first major motion picture. Andrew has appeared in many more films and television shows as well as some Parkway Playhouse productions over the years. Break a leg Andy! During the Civil War some 40 women stormed the Confederate Army stores in Burnsville, NC and took food supplies to keep their families fed. The next day a group of men raided the same Confederate encampment and stole guns and ammunition…. and a half a ton of bacon. This is world premiere play is a fictitious account that imagines events leading up to the aforementioned raiding. Written by Burnsville area poet and author Britt Kaufmann, this surprising and clever new play reminds us that heroes come can come from the unlikeliest of places. Think Steel Magnolias in the Civil War and you KIND of have the right idea…. We often take our liberty for granted. 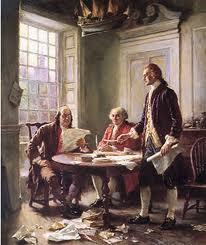 We perhaps forget that it took tremendous courage to sign the Declaration of Independence. In this amazing musical our history comes to blazing life as John Adams, Ben Franklin, and Thomas Jefferson struggle to forge a new nation. I love history. I love our American history and this production puts you in the room when the Declaration of Independence was signed. Incredible stuff. I like Dr. Seuss. Reading his books was a thrill as a child- the zany characters and the clever word play lend themselves to hilarious and dramatic antics. When I became a parent I re-discovered these stories and characters again as I shared them with my kids. 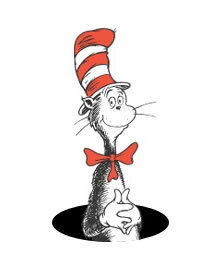 Seussical takes all of that big energy and pumps it in to an exhilarating evening with lots of singing, dancing, and of course the Cat in the Hat presiding over the whole event. It is also perfect for families and children of all ages. When I was about 9 or 10 my parents took me to see the 1938 Errol Flynn/Basil Rathbone version of THE ADVENTURES OF ROBIN HOOD. Around that same time, I saw my first play, the two events are linked in my mind. 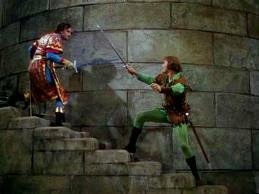 I think Robin Hood- and similar such swashbuckling stories are fun, lots of fun . The bad guys are clearly bad, the good guys are just and true, and the women are courageous and faithful. I don’t know what happened, but my generation has allowed Mel Brooks to co-opt Robin Hood. In fact most people when I say “Robin Hood” immediately follow it with “men in tights”. So this production, which was written by Jeff Douglas Messer- a truly Merry Man- and Robert Akers is a brash, smart, take on the classic legend with lots of swords. We’ll see about the tights. Robin Hood! This is the way it should be. We are still working out the details on this one. We have some interesting ideas that we will be sharing soon. Starting with Adam and Eve and ending with the birth of Jesus Christ the parishioners of the Open Heart Fellowship Community Church present their Nativity Pageant with vibrant folk-music and simple, down-home storytelling. This show-within-a-sh0w captures at once the spirit of the Holidays and the traditions and heritage of Appalachian Storytellers. So, there it is. Our season. The only question is what role will you play? We hope a big one. Get your tickets to A CHRISTMAS CAROL and watch this space! The Parkway Playhouse will present its 64th Season in 2010, with performances beginning in June and ending in September. 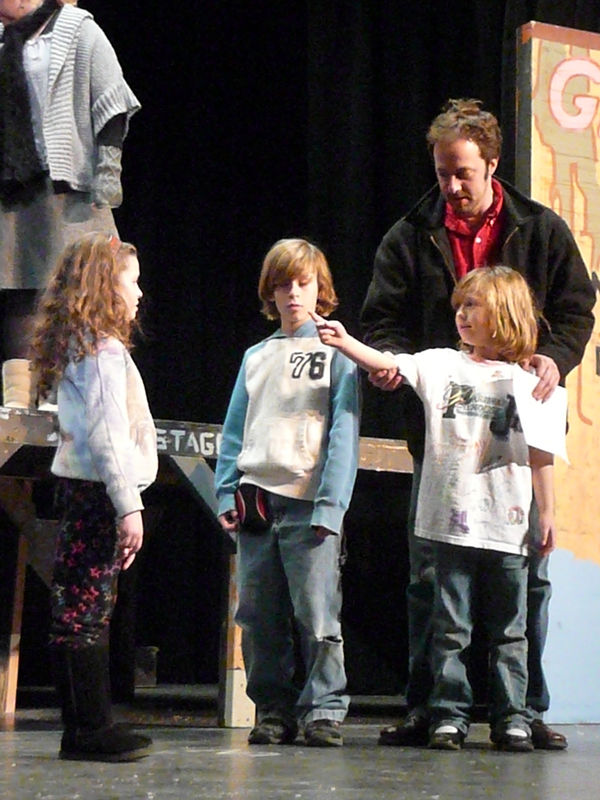 The theatre is seeking performers for the casts of 5 productions- 3 musicals, 2 plays. Scripts will be available for review at the Parkway Playhouse offices AND at the TRAC galleries in Spruce Pine and Burnsville. 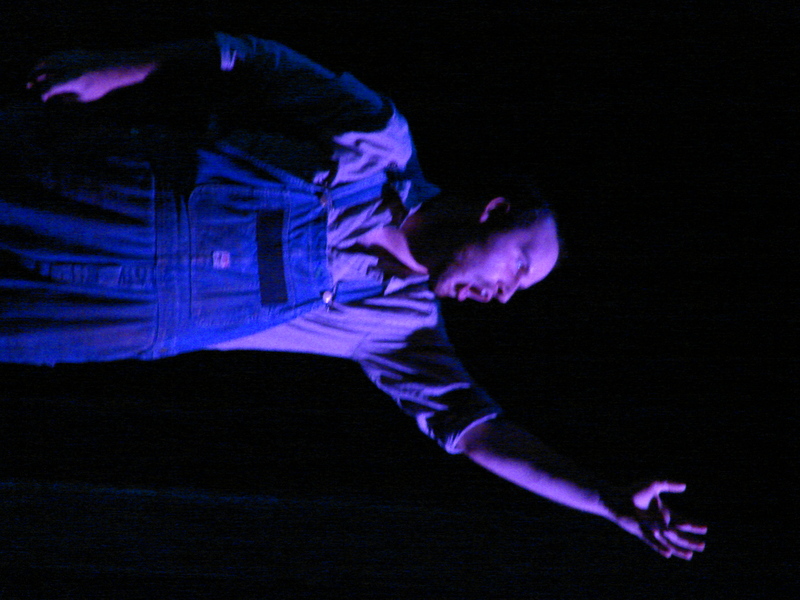 Jacob Stephen, who captivated audiences with his menacing portrayal of Jud Fry in the Parkway Playhouse 2009 production of OKLAHOMA won this leading role after attending an open audition. The Parkway Playhouse is a “teaching theatre” that uses a small company of professional actors, pre-professional college students, as well as people from the WNC community with a passion for theatre. The Parkway Playhouse is attending the WNC Unifieds in Asheville, NC on February 19th and 20th. All other auditions will be in Burnsville on the dates indicated below. Continue reading Parkway Playhouse Auditions Announced!!!! Posted on February 6, 2010 Author parkwayplayhouseCategories 2010 Season, Theatre newsTags Andrew Gall, Annie, Guys and Dolls, Leaving Iowa, Michael Lilly, Musicals, Pride and Prejudice, Tom Dooley1 Comment on Parkway Playhouse Auditions Announced!!!! 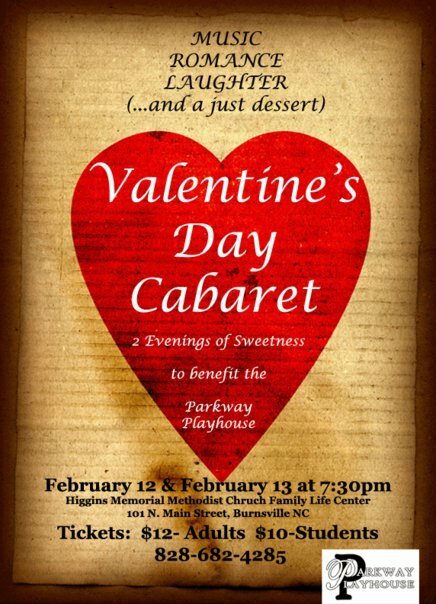 The Parkway Playhouse will present a Valentine’s Day Cabaret performance at the Higgins Methodist Memorial Church’s Family Life Center on Friday February 12 and Saturday February 34. The evening will include coffee and dessert and performances of songs from a number of Broadway shows ranging from the classic Phantom of the Opera to the recent Dolly Parton musical 9 to 5. Performers at the event include area favorites and Parkway Playhouse regulars like Dominic Aquilino, Noah Gavenus, Izzie Hilbert, Debbie Phillips, Ronnie Robertson, as well as some new faces. 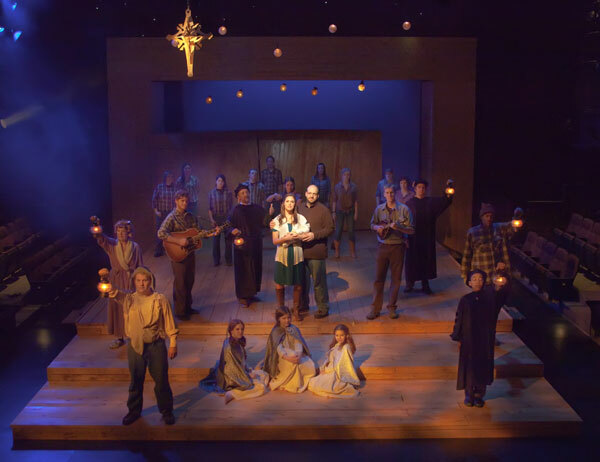 A highlight of the evening will be the debut of some of the world premiere musical The Ballad of Tom Dooley which will open at the Parkway Playhouse in the upcoming summer season. Tickets are available 24 hours a day at the Parkway Playhouse website or by calling the Parkway Playhouse at 828-682-4285 and leaving a message. Come join us at 7:00pm! Tickets are $12 for adults and $10 for students 16 and under. Proceeds from the event will benefit the Parkway Playhouse. In addition to the entertainment, guests will have the opportunity to purchase Parkway Playhouse 2010 Season Passes and enjoy coffee and dessert while being entertained. For more information about The Valentine’s Day Cabaret or the upcoming 2010 Parkway Playhouse season please call the Parkway Playhouse at 828-682-4285, visit the Parkway Playhouse website, or become friends with us on facebook. Posted on February 5, 2010 February 6, 2010 Author parkwayplayhouseCategories Theatre newsTags Musicals, Special EventsLeave a comment on A Valentine’s Day Cabaret!